GRIFFITH, Indiana - The remains of an Indiana Marine Corporal killed in Vietnam 32 years ago have been identified and will be interred at Arlington National Cemetery in Virginia, family members said. 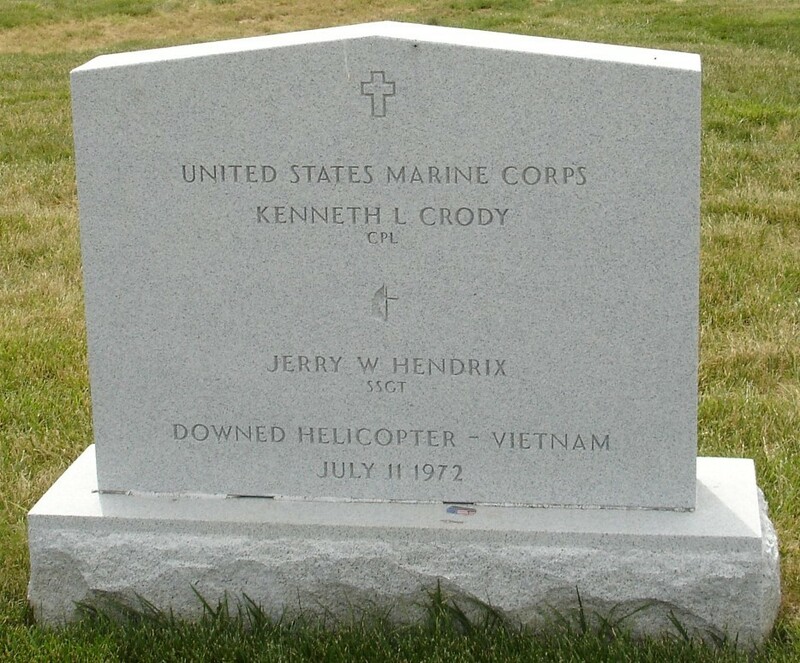 Kenneth L. Crody of Griffith had been listed as missing in action or killed in action/body not recovered since his Sikorsky CH-53D Sea Stallion helicopter was struck by a ground-to-air missile on July 11, 1972. Most of the 56 aboard were killed. His remains and those of another crew member, Sergeant Jerry Hendrix of Wichita, Kansas, were identified five weeks ago through DNA analysis. The soldiers' families will choose a date for their joint burial later this summer at Arlington. Crody's parents, Guy and Wilma Crody, now live in Linton, about 30 miles southeast of Terre Haute. Griffith is about 7 miles southwest of Gary. "It will be so comforting to know our Kenny will be finally buried right," said Wilma Crody, who's in poor health and will not attend the burial. "It's OK, I guess. At least I have his dog tag and his class ring." Crody was three weeks shy of his 19th birthday when he died. The helicopter had launched from the USS Tripoli to drop 50 South Vietnamese marines behind enemy lines near Communist-occupied Quang Tri City. "Don't worry, Mom," he had told his mother just weeks earlier. "Marines aren't ever sent into Vietnam. I'll be fine." As the Sikorsky, on which Crody was a door gunner, approached the drop zone, still 100 feet above the ground, a heat-seeking SA-7 missile hit its starboard engine. The blast ignited fuel and ammunition on board. Crody's remains were excavated in Vietnam on August 29, 2000. They were identified earlier this year along with remnants of some personal items, including his double-edged razor, nail clippers and part of his watch. The remains were identified in March, said Air Force Lieutenant Ken Hall of the Joint POW/MIA Accounting Command, which was formed last year from a merger of the U.S. Army Central Identification Laboratory and the Joint Task Force-Accounting Command. It identifies about two Americans a week. An estimated 1,800 Americans are missing from the Vietnam War. Crody's sister, Beverly O'Brien of Santa Fe, Texas, said her younger brother had worn his dress blues when he served as best man at her wedding nearly a year before he died. "That's the last time I saw him," she said. "He was only in Vietnam for a month before he was killed." She named her first-born son Kenneth. "I got pregnant right after my brother died. It just seemed right," O'Brien said. Corporal Kenneth Crody was assigned as a door gunner with HMM-165 embarked in USS TRIPOLI (LPH 10). On the morning of July 11, 1972, Crody's CH-53D helicopter launched from the USS TRIPOLI to insert South Vietnamese Marines behind enemy lines near Communist-occupied Quang Tri City, Republic of Vietnam. The CH-53 carried 50 Vietnamese Marines, an American crew of five and a combat photographer from BLT 1/9. While approaching the drop zone and while still 100 feet above the ground, the helicopter was struck in the starboard engine by a heat-seeking SA-7 missile. The detonation of the SA-7’s 5.5 pound warhead in the helicopter’s starboard engine sent engine turbine fragments into the passenger compartment. The pilot autorotated the flaming aircraft to the ground in a controlled "crash and burn" procedure. Two crewmembers were killed outright and a third seriously injured. Most of the Vietnamese troops on board were killed, with only seven returning to friendly lines. The helicopter was completely destroyed by fire and the detonation of ammunition carried by the Vietnamese. The surviving Americans took shelter in a nearby bomb crater and hunkered down as the wreckage cooled and NVA soldiers poked through the remains. At dusk, a Vietnamese Marine patrol located them and brought them to friendly lines. American Army helicopters returned them to their ship. Remains of local Vietnam vet finally identified, returned for proper burial. The name of Kenneth L. Crody is chiseled into Griffith's War Memorial as "missing in action" since 1972. After 32 years buried under foreign soil, the U.S. Marine corporal's remains were excavated from South Vietnam on August 29, 2000. Crody's tiny, fragmented skeletal remains were finally identified April 23 of this year, along with remnants of some personal items -- his double-edge razor, nail clippers, part of a comb, part of his watch and a standard, military-issued fork and can opener. And his dog tag. The only thing left intact. The Griffith teenager was three weeks from his 19th birthday when he died. On the morning of July 11, 1972, Crody was flying in a CH-53D helicopter carrying 50 South Vietnamese Marines, an American crew of five and a combat photographer. The chopper was launched from the USS Tripoli, its mission to drop the Marines behind enemy lines near Communist-occupied Quang Tri City. Crody, who enlisted at 17, served that day as the chopper's door gunner. "Don't worry, Mom," he told his mother, Wilma Crody, weeks earlier. "Marines aren't ever sent into Vietnam. I'll be fine." Those were his last words to her. As the chopper approached the drop zone, still 100 feet above the ground, a heat-seeking SA-7 missile hit the aircraft's starboard engine. The missile's 5.5-pound warhead exploded engine turbine fragments into the passenger compartment. Crody, along with another crewman, Marine Staff Sgt. Jerry W. Hendrix, died at the scene. A third Marine was rescued but died of his injuries a month later. Seven of the 50 Vietnamese Marines made it out alive. Back in the states, Wilma Crody, driving to her job at Purdue University Calumet that day, clicked on the car radio and heard a special report: A U.S. helicopter was shot down by hostile gunfire in South Vietnam. Dozens of casualties. Crew presumed dead. "Those poor guys," Wilma sighed to herself. Later that day, two Marines walked up to Wilma at work. That's about all she remembers from that day. That's about all she cares to remember. Shortly after Crody's death, the family held a memorial service for their "Kenny." "We had to do something for him ... for me... for us," Wilma said. "It helped some." A couple years later, Crody's father, Guy, lost his job at a local plant. Guy and Wilma, who came to Griffith in 1949, left the region to find work in Texas. The years peeled away. Five, 10, 20. Then they moved back to Indiana, to downstate Linton, about 80 miles south of Indianapolis, to be near family. The Marines sent occasional letters to the couple, informing them that efforts were being made to find their boy's body, along with 1,859 other MIAs from the Vietnam War. In 2000, Crody's sister, Beverly O'Brien, was asked for a DNA sample by the Joint POW/MIA Accounting Command, a military and civilian group based at Hickam Air Force Base in Hawaii. The high-tech group conducts recovery and forensic identification efforts of missing soldiers. The family got its hopes up. But another year peeled away. And another and another. "I always had hope, but ..." said O'Brien, who lives in Texas. The last time she saw her brother was at her wedding, almost a year before his death. He assured her that he was being shipped to the Philippines, not Vietnam. "He was only in Vietnam for a month before he was killed," O'Brien said. Marthann Gatlin has lived in Griffith for 35 years. She's a member of the town's war memorial committee, which erected the Central Park War Memorial to honor local soldiers. "I feel like I've come to know Ken Crody through the years," she said. She never honestly believed his remains would be found, but she prayed for it each night, she said. Delford Jones, chaplain for the Griffith VFW Post 9982, said he will have a hard time finding the words today to express how the town feels about Crody's homecoming. At 10 a.m., the VFW will honor Crody during its annual Memorial Day ceremony. "To find a soldier's remains after all these years is so special," Jones said. "To know that soldier is from Griffith makes it so much more." Wayne Govert, a Griffith businessman who knew Crody in high school, said, "This means so much to this town. Especially to the people who remember Kenny. He's finally coming home." Five weeks ago, Crody's remains were identified, along with the remains of Hendrix, who was from Wichita, Kan. It turns out that DNA comparisons were not used in the "group identification," officials said. Both Marines will share a joint burial this summer at Arlington National Cemetery in Virginia. The soldiers' families are choosing a date. "Families live for this day, for closure if nothing else," said Hattie Johnson, head of the Marines' POW/MIA Affairs Headquarters in Quantico, Virginia. It was Johnson who visited Crody's parents last month at their Linton home to tell them the news in person. In the past three years, Johnson has visited with seven families of soldiers whose remains were found. Everyone treated her like family, she said. This summer, Crody's remains, escorted by a Marine, will be flown from Hickam Air Force Base to Arlington National Cemetery for a proper military burial. "It will be so comforting to know our Kenny will be finally buried right," said Wilma, who's in poor health and unable to attend the burial in Virginia. "It's OK, I guess. At least I have his dog tag and his class ring." Crody's sister, however, will attend with her family, including her first-born son. His name is Kenneth. Corporal Kenneth Crody was assigned as a door gunner with HMM-165 embarked in USS TRIPOLI (LPH 10). On the morning of July 11, 1972, Crody's CH-53D helicopter launched from the USS TRIPOLI to insert South Vietnamese Marines behind enemy lines near Communist-occupied Quang Tri City, Republic of Vietnam. The CH-53 carried 50 Vietnamese Marines, an American crew of five and a combat photographer from BLT 1/9. While approaching the drop zone and while still 100 feet above the ground, the helicopter was struck in the starboard engine by a heat-seeking SA-7 missile. The detonation of the SA-7’s 5.5 pound warhead in the helicopter’s starboard engine sent engine turbine fragments into the passenger compartment. The pilot autorotated the flaming aircraft to the ground in a controlled "crash and burn" procedure. Two crewmembers were killed outright and a third seriously injured. Most of the Vietnamese troops on board were killed, with only seven returning to friendly lines. The helicopter was completely destroyed by fire and the detonation of ammunition carried by the Vietnamese. The surviving Americans took shelter in a nearby bomb crater and hunkered down as the wreckage cooled and NVA soldiers poked through the remains. Griffith, Indiana, native Kenneth Crody, a Marine corporal whose remains were recently identified, will be buried next week at Arlington National Cemetery with full military honors. Crody was 18 when the helicopter in which he was serving as door gunner was shot down by a ground-to-air missile and burst into flames in Vietnam in 1972. For years, Crody had been listed as missing in action or killed in action/body not recovered. His sister, Beverly O’Brien of Santa Fe, Texas, said the family was asked four years ago to provide samples for DNA testing. Then the family didn’t hear anything from the military. “We kind of gave up,” she said. A few months ago, however, her parents, Guy and Wilma Crody, received a visit from the Marine Casualty Division at their home in Linton, southeast of Terre Haute. 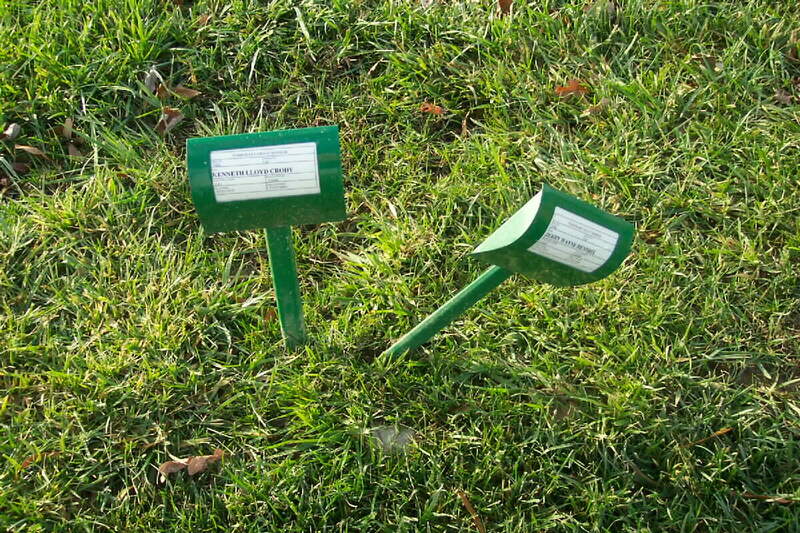 After more than three decades, their loved one’s remains had been identified. “We never thought the day would come. It’s so amazing, like something you see in a movie,” O’Brien said. Kenneth Crody’s namesake, O’Brien’s oldest son, was married last weekend and will return from his honeymoon in time to leave Monday for Arlington, Va. Also making the trip are her parents, O’Brien’s husband, their younger son and his family, and her brother David and his family. The prospect of a funeral after 32 years brings mixed emotions to the family. “It’s going to be a hard day to get through and I’ll be glad when it’s over. But I’m glad it’s happening,” O’Brien said. Even now, it’s difficult for the family to talk about their loss. “I’m just so glad. He would be surprised at how may people turned out at the memorial in Griffith and how many people remembered,” she said. A special wreath-laying was held at the Griffith War Memorial at Central Park on Memorial Day to honor Crody. O’Brien said she remembers letters from her brother talking about how proud he was to be a Marine and to serve his country, even though the war was unpopular among Americans back home. “I still have all the letters my brother wrote to me. He never, ever complained,” she said. O’Brien was living in New York City at the time and remembers her brother asking for a subway map so he could find his way around when he came to visit. He never got to ride the subway. She last saw him at her wedding in 1971, wearing his dress uniform. Though the family felt certain Crody was dead, the official confirmation was to take years. The Joint POW/MIA Accounting Command in Oahu, Hawaii, used mitochondrial DNA analysis and other information to identify Crody’s remains. Mitochondrial DNA is passed from a person’s mother, so siblings born to the same mother would have the same mitochondrial DNA sequences. Crody, who quit school and enlisted in the Marines at age 16 with his parents’ approval, died during a July 11, 1972, attack by the North Vietnamese Army 11 miles south of the demilitarized zone in Quang Tri Province. Crody and crewmate Sergeant Jerry Hendrix will be buried at 3 p.m. Tuesday. The Sea Stallion lifted off from the USS Tripoli on the morning of July 11, 1972. It was one of 34 Marine helicopters ordered to land 840 troops behind enemy lines near Quang Tri City in Vietnam. The CH-53D carried 50 Vietnamese Marines along with an American air crew, a Marine combat photographer and two door gunners: Corporal Kenneth Crody, 18, and Staff Sergeant Jerry Wayne Hendrix, 29, just a few weeks short of finishing his second tour of duty. Hendrix had a wife and two small boys that he adored back in Wichita, along with a mother who worried constantly. But any time someone fretted over his safety, he'd tell them nothing was going to happen. "He thought he was invincible," his sister Paula said. Jerry Wayne Hendrix loved a good fight. Never mind that, at 5-foot-8 and no more than 150 pounds, he lost a lot of them. He still liked to pick a fight with the biggest guy in the bar, come home, get stitched up and go back for more. He relished a good practical joke, and couldn't resist driving 100 mph in whatever set of wheels he owned at the time -- a Mustang, a Jaguar, a yellow Corvette convertible or a Javelin sports car. He joined the Navy in 1960 after high school, but it was in the Marines that he found a home. He enlisted in 1964 from the Navy Reserve and rose through the ranks to become a staff sergeant -- the same rank his dad had achieved in the Air Force. "Going into the Marine Corps probably kept him out of jail," his oldest sister, Paula Johnson, said with a chuckle. It was always cause for a family celebration when he came home on leave. He'd play pranks on his little sisters, tying the toes of their socks together so they'd stumble around when they walked, or putting his youngest sister, Patti, up in the closet for a game of hide-and-seek and then "forgetting" about her. "When Jerry was around his sisters, that's all that mattered -- that was it," said Shelly Ramsey, one of his six sisters. "We were little princesses to him." He could always make them laugh. "He did Donald Duck better than Donald Duck did," said Billie Jaso, another sister. He would take the younger siblings of his wife, Deborah, to the store and show them how to open pop bottles with their teeth and dent vegetable cans with his bare hands. "He was a man's man," Deborah said. "I remember him holding his boys up and saying, 'You are fighting Cossacks!' "
After his best friend died in a violent wreck, Jerry warned his wife that he would probably die violently, too. "It's either going to be a war or a car accident," he told her. "God's gonna get his revenge because I was such a rotten little kid." He had survived one tour of duty in Vietnam in the late '60s, then decided to go back in 1971. "We never asked why," Ramsey said. Being a Marine was his life. The night before Jerry shipped back to Vietnam, he took his infant son, Troy, and the stepson he was in the process of adopting, Tony, and carried them out to the living room couch. "I want you to always take care of your mom," he told them, "and I want you to be good men like Dad." Then he held them the rest of the night. His mother was rarely at peace after he left. If a few weeks went by without a letter or a phone call, she would be tracking down his officers to find out why. "She could be persistent," Johnson deadpanned. So persistent, in fact, that there were times Jerry would be permitted to talk with his family while he was on a mission. They'd be on a phone, and he'd be on his walkie-talkie. "We'd have to say, 'How are you doing? Over. "I'm fine, how are you? Over,' " Jaso said. By the time the summer of 1972 rolled around, Jerry was just a few weeks from coming home. Deborah and the boys moved to Wichita to be with Jerry's family when he returned. The day was getting so close, and yet his mother still worried. As the helicopters neared their landing zone, they were greeted by intense enemy fire from entrenched North Vietnamese forces. A surface-to-air missile struck Hendrix's Sea Stallion when it was about 100 feet above the ground. Engine fragments exploded into the passenger compartment, igniting fuel and ammunition. As the pilot brought the chopper down in a controlled crash landing, the heat and fire set off a series of explosions inside the fuselage. The pilot, co-pilot and combat photographer escaped, and the crew chief was pulled from the wreckage, his clothes aflame. All but seven of the Vietnamese soldiers died in the crash. Those who survived made their way back to friendly forces. The Americans waited in a nearby bomb crater, watching silently as North Vietnamese soldiers sifted through the charred remains of the helicopter. They would be found later that night by a rescue team and returned to the Tripoli. The crew chief, Staff Sergeant Clyde Nelson, would die a month later from his wounds. No one saw Crody and Hendrix again. The men in dress blues visited the house on West 29th Street a couple of days later. "Those people walking up to your door -- oh, my God, your heart stops," said Ramsey, who was 10 then. "It's a horrible, horrible feeling." The officers told the family that Staff Sgt. Hendrix's helicopter had gone down in flames after being hit by enemy fire, and that he was presumed dead. Jerry's mother calmly asked a few questions, but no one broke down until the officers had gone. "It was just total disbelief and shock on everyone's faces," Ramsey said. Deborah began screaming and rocking back and forth. "I've lost my first child," Jerry's mother said to no one in particular. "I've lost my only son." And then she became hysterical. A memorial service was held on July 27, 1972, at McConnell Air Force Base. But Jerry's body and dog tags had not been found. His death could not be confirmed. His mother held onto the hope that somehow he had survived the crash and was still alive. His family put on prisoner-of-war-missing-in-action bracelets and tried to get on with their lives. But the questions nagged at them. Is he dead? Is he a POW? Is he still over there somewhere? "The thoughts that went through our minds all of these years..." Ramsey said, her voice trailing off. July 11 became a dreaded day on the family calendar. "Lots of crying goes on in my family on that day," Ramsey said. Jerry's son and stepson, Troy and Tony, grew up without him. "It feels very strange," Troy said. "I've had a lot of weird emotions. All you have is stories -- you don't have any memory." Troy is 6-foot-2 and weighs well over 200 pounds, but he looks and acts so much like the father he never knew "it's eerie," Ramsey said. Just like his stepfather, Tony went into the Marines. He researched Jerry Hendrix's final mission, and carries the vital statistics in his wallet. "I went in right when the first Gulf War broke out," he said. "That tore my mom up, but I just felt like that's something I had to do." The war ended before he was shipped overseas. He spent more than 10 years in the Marines and hoped to become a staff sergeant -- just like his stepfather -- when he injured his neck and shoulder lifting weights and had to accept a medical discharge. "From everyone that I talked to, he did love his boys," Tony said. "We were his pride and joy. We were everything to him. "It makes me feel good. I know that he loved us. I think we would have had a better life growing up had he come home." Jerry's father died in 1995 without ever knowing for sure that his son was gone. "We buried him with his POW-MIA bracelet on," said Patti Bush, one of his daughters. One day in 2000, Paula Johnson received a letter from the military, asking her to call. Human remains had been found, and the military had reason to believe they might be Hendrix and Crody. The letter and phone call hit family members like a left hook. "It was almost like a call saying that he was dead," Ramsey said. It snuffed lingering hopes that, somehow, somewhere, he was still alive. Family members provided DNA samples, but a match couldn't be made. One year passed, and then 9/11 brought identification efforts to a standstill. Jerry's mother became gravely ill, and his sisters pressed the military for answers. She died last year before confirmation came. "We figure she found out before we did," Ramsey said. This spring, officers in dress blues paid another visit to the Hendrix family. The officers told family members that an exact match was not possible because the human remains were so badly burned that DNA could not be extracted. The skeletons had been fused together by the intense heat of the burning helicopter. But the remains contained the left femurs of two Caucasian males -- and the only two Caucasian males who did not emerge from the crash were Cpl. Kenneth Crody and Staff Sgt. Jerry Hendrix. Personal items and dog tags belonging to Crody were found nearby. Together, those things were enough to convince authorities that the remains belonged to Crody and Hendrix. They will be buried together with full military honors at Arlington National Cemetery at 3 p.m. Tuesday -- 32 years to the day after the memorial service for Hendrix at McConnell Air Force Base. The crowd will include all but one of Hendrix's sisters, his widow, his two sons and his two grandchildren. A local memorial service for Hendrix will be held at 10 a.m. Saturday at Resthaven Mortuary. "It is final, and that's a good thing," Ramsey said. "You've got to have that closure. To just sit and continue to wonder and wonder and wonder..."